As part of Mobility Field Day Live, I had the opportunity to visit Aruba, a Hewlett Packard Enterprise Company at their Executive Briefing Center in Sunnyvale to learn about their newly introduced Mobile First platform. The foundation for the platform is ArubaOS 8, which is a major new release with a long list of new features that will give you flexibility in your deployments. Let’s start with the Virtual Mobility Controller (VMC). This is a virtual wireless controller that includes feature parity with the hardware controllers. Yes, that really does include the data plane. I’m told that the only real bottleneck is throughput and they are seeing 4-5Gbps on your average VM host, which sounds pretty reasonable. If you need more throughput, you can scale out with more VMCs or you can still go with hardware controllers. The physical controllers have hardware acceleration for the encryption processes, which is why a big controller like a 7240 can push as much as 40Gbps. The way Aruba has chosen to license the VMC makes scaling with it easy, at least assuming you have the VM hosts around to accommodate them. The Virtual Mobility Controller is licensed by the number of APs managed by the Mobility Master, not the APs managed by individual controllers. You can license the VMC in groups of 50, 250, or 1000 APs, but if you install a VMC in standalone mode you must apply the license directly to the controller and lose the ability to share the licenses. This means that if you have 1000 AP licenses attached to your Mobility Master, you can attach any number of VMCs to the Mobility Master so long as your total AP count does not exceed the license. This gives you the flexibility to add additional controllers when and where you need them. Currently, only VMware is supported, but KVM support will be coming with ArubaOS 8.0.1. So how does this actually work? Every half hour, each AP will measure the RF environment for 5 minutes. During the day, these measurements are collected by the Mobility Master. At 5am every morning, the Mobility Master will churn through the numbers from the last 24 hours to determine the optimal channel plan for all the APs and deploy those changes to the network. There are two exceptions to this. First, when an AP is first detected by the Mobility Master, it will recalculate that APs channel and power settings every 30 minutes for the first eight hours. After that, the new AP is on the same schedule as the rest of the network. The second exception is in the case of a DFS event or significant interference. In either of these cases, the AP can change channels on its own. If you want to see the changes that the Mobility Master is making, you can view some of the details in the AirWave Network Management console. This really only scratches the surface of what’s happening with the Aruba’s Mobile First Platform launch. Updates to Aruba Central to manage ArubaOS switches, Aruba Clarity for proactive monitoring, ClearPass Extensions that enable third party development, APIs for developers to create detailed analytics and much more. 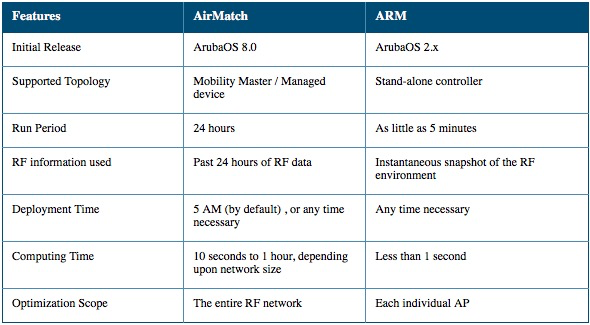 Aruba has released a lot of exciting enhancements that will be the foundation of your networks for years to come. Disclosure: As a delegate for MFD Live with Aruba, Aruba indirectly paid for my travel and meals during the event and also compensated me for my time to write this post. This post is still my opinion and only I have editorial control of the contents. This stuff genuinely is exciting! Aruba did request I use their tracking links, which seemed like a reasonable request. This entry was posted in Wireless and tagged Aruba, ArubaOS, MFD by scottm32768. Bookmark the permalink.